Jos Delbeke (1954, Belgium) is Senior Adviser at the European Political Strategy Centre, European Commission, and Professor at the European University Institute in Florence and at the KU Leuven in Belgium. He has been the Director-General of the European Commission’s DG Climate Action since its creation in 2010 until 2018. He holds a PhD in economics (Leuven) and joined the European Commission in 1986. He was very involved in setting the EU’s climate and energy targets for 2020 and 2030, and was a key player in developing EU legislation on cars and fuels, the Emissions Trading System (ETS), air quality, emissions from big industrial installations and chemicals (REACH). As an economist, he always underlined the role of market-based instruments and of cost-benefit analysis in the field of the environment. 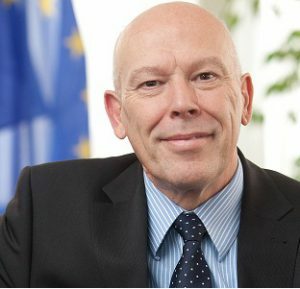 Mr Delbeke has been responsible for developing Europe’s International Climate Change strategy and was for several years the European Commission’s chief negotiator at the UNFCCC Conference of the Parties. In that capacity he played a key role on the EU’s implementation of the Kyoto Protocol and in the negotiations on the Paris Agreement.